ProTec humidifier filters work efficiently to clean the water entering your humidifier of harmful minerals, keeping your humidified air clean. 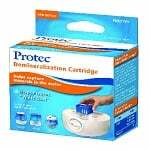 The ProTec Humidifier Tank Cleaning Cartridge PC-1BX is a concentrated antimicrobial cartridge that gives continuous protection against slimy build-up in your humidifier. 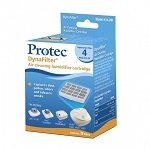 ProTec PDC51 Demineralization Cartridge helps to filter the water in your humidifier by removing large particles and minerals to keep them from dispersing into the air with the water. 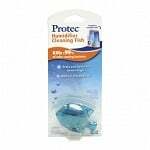 The Protec PC1F Humidifier Cleaning Fish features a patented antimicrobial, Aquastat, that helps keeps your humidifier cleaner longer. The ProTec Vicks Cool Mist Humidifier DynaFilter 3pk is an advanced 2-stage filtration cartridge made of exclusive cross-woven polyester and activated carbon.